The boxes are nouns, the lines are verbs. There are three feedback loops. The “natural systems” loop is the only one that would exist if there were no sentient beings capable of affecting the universe. 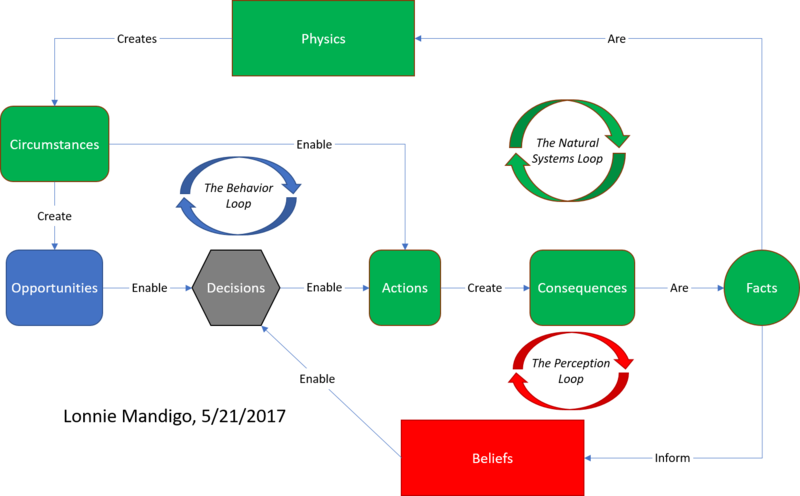 Decisions anchor the role of rational and sentient beings via the perceptual and behavioral loops. A good way to misread this sketch is to believe that it shows how perception and behaviour are outside of nature when they are actually just more detail. There are a lot of more detailed systems in the natural loop. There’s probably a better way to capture this relationship. Decisions are what couple perceptions and behavior. Decisions require both an opportunity and a set of beliefs before they can enable an action. Beliefs are formed by exposure to facts. Here you think about facts in a fairly strict sense. It may be a fact that someone told you something that they asserted is a fact. The fact that they asserted may not have actually been a fact, but the person asserting that it is a fact is a fact. (Sigh, language is so hard.) You end up with a notion of directly experienced facts, e.g. what I heard someone say, and reported facts, e.g. what they said. There’s an 80/20 possibility here where 80 percent of your belief system is based on reported facts and 20 percent is based on direct experience. I don’t know if this is true, but it’s an interesting hypothesis. A future ponder many be to examine the process (verb) of how facts inform beliefs. Tagged Behavior, Decision Making, Perception, Systems.